My name is K, Cindy's oldest son. 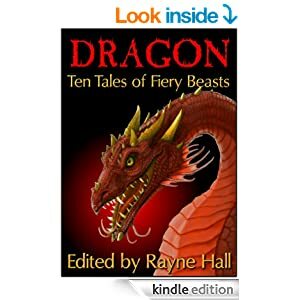 I just had been given a chance to review a new e-book called Dragon: Ten Tales of Fiery Beasts. You can buy this book at amazon for your Kindle here. This book was a great read. I couldn't put it down! I got it on Thursday and I finished it before I went to my Dads on Saturday morning. The book is an anthology of 10 different authors. Because it is many different stories it takes place during different times. Also, it takes the view of the dragon in some stories and the view of the humans in others. It even has good and bad dragons in it. * Alone with the Bones - This story involves the main character bringing the dragon back to life. My only dislike was that every story has humans in it. I think that it would be interesting if one or more stories had a peopleless world. The story that comes the closest to this would be The Introvert Dragon but even this story had the main character (who is a dragon) eating people. All of the stories had characters facing a conflict of some form or another and trying to overcome these conflicts. In conclusion I enjoyed reading this book and plan to read it again in the near future. Lovely review, K. I hope that you enjoy it as much the second time around. Thanks for reviewing my book, K! I like the way you said what you like most and what you like less. This makes your review genuine and balanced. Good job! Hi K - enjoyed your review :) If I hadn't read DRAGONS already, I would pick it up from your review. Happy reading. I'm so glad you enjoyed the Dragon collection. Keep on reading and keep on responding to books. Authors like me — and the other Dragon contributors — love hearing from readers. We want our creations (human, dragon, vampire or anything else) to live and they live because people read our stories!